My Kids are So Talented! A few weeks ago, we went to a day of scrapbooking and card making at my friend Gigi's house. It was a lot of fun taking the girls with me. They are old enough now that they can work on their own projects. Can't wait to have space in our new house for playing with paper. I love this one! CC made it. Isn't it clever?! I may have to 'scraplift' this one! And Q made this doggy layout. Soooo cute! What a fun site. If you don't want to pile up the paper and embellishments...you can do it digitally. This was my first attempt, just for fun. What do you think? It's not really the same as playing with paper for me. I kind of like the mess of my scrapbook desk. BUT you can print them out or order them printed. Not sure what size is available. I'll have to play around with it more when I have time. I think you can buy more embellishments to use over and over as well or use their pre-made themes. This one was free to create and to share. It's Wordless Wednesday...so here are some pictures I took at our land this morning. Anyone that truly knows me, knows that I do not rush into a purchase. I research, read, question, test and pretty much over think it to the end of the earth and back. I have a few resources I love to pour over online and in print. Two being Kim Komando and Consumer Reports. I don't know what we did before the internet!?! It was kind of creepy last month when the issue of Consumer Reports was all about product reviews for remodeling your home--flooring, appliances, etc. It's almost like they were in my head and knew just what I was looking for as our house sold and the land deal was signed. So I have been researching a new digital SLR. I had a regular SLR for years. Fancy lenses and all the bells and whistles. (It took me a few years to buy that one too...the money I had for it sat in a savings account for over a year accruing interest) I was getting pretty good at it too when this digital thing happened. The turning point was our trip to Alaska. I didn't want to carry all the film around and I didn't want to get stuck with developing any shots that didn't turn out. So we bought a Kodak Easyshare DX6490. It was a work horse of a camera! Took awesome pictures throughout out trip to Alaska and back home since then. My only complaint was it's inability to take pictures inside of a gym. I was sitting in the second row when I took this picture...full gym lighting. Flash did nothing but give everyone red eye. The 'noise' was horrible in low light and with all the events and award ceremonies my kids have these days in gyms with poor lighting...so 5 years and many pictures later...it was time to move back to a real SLR again that I can manually set to compensate for what the Kodak can't do. We aren't getting rid of it. CC is already marked it as hers. Should come in handy on those bone digs she dreams of heading up someday! It came with two lenses, camera bag to hold everything and directions in English AND Spanish. So I can work on dusting off my second language even! Anyway, what sold me was the two lenses, how easy it fit in my hand, and the light weight, even with the larger lense on it. It is larger, just a bit, than the Xti, but lighter in weight...go figure. It has 12 mega pixels vs the 14 or so that the Xti has, but too many megapixels will also add 'noise' to your photos and as far as increased pixelation goes...2 more mp's is not much of a difference. I bought it at Costco because we get a great rebate and if I have any trouble with it, they have a great return policy. I haven't gotten through the entire manual yet. There are so many features on this camera. Not that I don't know how to use the features, but it's just navigating the buttons to get to them :-) But I've been playing with it none the less. Here are a couple shots I've taken so far. This one was taken south of Spokane off highway 195. Q's friend just moved out there...it's sooo pretty! Cricket...uh..her name...not her species. LOL! cool old stuff around this county! The neighborhood deer munching on clover. Well, I have a lot to learn again about using an SLR...but it's coming back. I just need to get out and find some more fun stuff to photograph! I love fonts...I've posted before about some of my favorite sites for getting free or dirt cheap fonts to add to you computers. But what fun are fonts if you have nothing to print. So here are a few quotes that might come in handy for making some inspirational cards. Have fun and make some creative cards. If you email me a picture of one, inspire others! I'll be glad to post it to show it off for you! Shedding the Old...and making some cards while I'm at it! Here it is: New Year's Eve! Another year has ended. My main resolution for 2009 is to shed the old and move forward with the good. If it's not something that ads to me becoming a better person, a better mom, a better teacher...then it's going to be left in the dust. If that means losing pounds, or losing a website business or blog...so be it. I am ready for some change again. I have to mix things up a bit. Of course, this blog isn't going anywhere...but I am meaning to add more to it as the days and month of 2009 progress. One of the things I realized is that I haven't been using my creative side much these days. My camera as well as my scrapbook supplies have been collecting dust! This week I have been dusting both off. So first I am going to post some Thank you cards I made quickly and very inexpensively I might add! Some winter...Sno-kane...photos will follow shortly as well! The striped card is from the .60 cent bin at Michaels. I bought about 6 packs of them. They are called Perfectly Posh. 8 cards and envelopes in a pack...what a steal! I used my Cricut to cut the Thanks and mounted it on CTMH chocolate cardstock. Tied off a pink ribbon and a pink glittery heart that I bought on clearance somewhere...and ta da... It's done! My husband didn't get the T U on the card. my texting kids did though! LOL! These were also cut on the Cricut and mounted on CTMH chocolate cardstock. A little fiber and....Simple! o.k. this one was wicked simple. Just attach three blue chip board letters and done! When I run out of the chip board ones that match, I'm just going to cut them out with my Cricut. A little sanding on the cardstock letters and it adds a softer contrast around the edges. Another glittery pink heart and this one is good to go! My fun Christmas toy...the Cricut Design Studio. It is software that loads onto my laptop. Now my laptop can communicate with my Cricut and I can mix designs from the various cartridges onto a template on my computer then lay it all out and hit cut! No more guessing about size and will it fit! What fun! I am putting together some fun calendars this week with it. I'll be sure to take pictures and share! Well here something fun to do to make use of your time stranded at home due to the weather. (We had over 9 inches today!) creating Keepsake just announced a new Call for Submissions. They are looking for lots of creative ideas from everyday scrappers like us. I just made some thank you cards last night. I used an assortment of supplies and my new Design Studio that works with my cricut cutting machine. I will post them when I get a moment to download the camera card. I was hopping around on my friend, Jeni's, blog. She is an amazing artist, photographer, friend and mama. If you want to discover some cool and wild ideas, check out her blog, Paper Piecing. But if you are ever in Twin Falls there is a great scrapbook store called Scrappin' Girlfriends. Love the name! I really love their website. It's gorgeous! And if you are looking for some creative scrapbooking ideas, go to their gallery and view the many items they have--neatly organized by category--I love that part too! Their site header is inspiring all on its own! The ideas are rolling...now I just need the time to do something! Knit One, Pearl Two....by George, She's Got It! 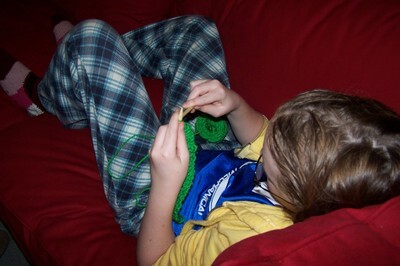 The Knitting gene is in our family. There's no denying it. But sometimes I think it's a bit recessive and doesn't like to announce itself till it's good and ready. I remember my Grammy knitting and I'm sure her mother did before her. My mother inherited the skill big time! I grew up amid balls of yarn, stitch holders between the couch cushions, and oodles of baby sweaters in all shades and colors. I probably learned how to count by sorting the needles by size. I can remember playing with them and organizing and reorganizing them by size, type and color, when I was a kid. (Hmmm...me organizing something? I was wacky that way even when I was young). 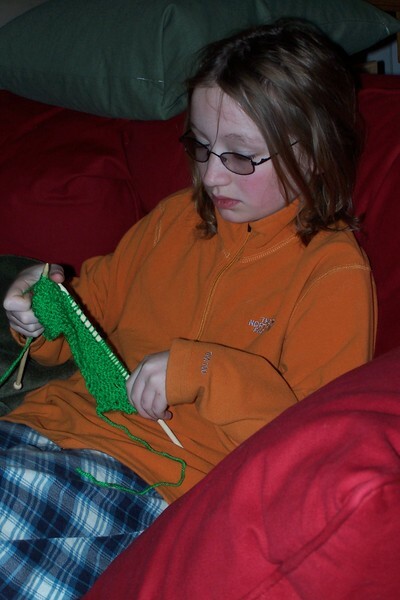 So I learned to knit. Mom tried showing me over and over again. I never got past a simple scarf. Maybe with some Pearls thrown in by accident of course. BUT...after college I moved to Wyoming. I worked at a really cool place called the Teton Science School. Lots of bison, moose and antelopes...but no t.v. reception of any sort. The closest video store was a 25 minute drive (in good weather). 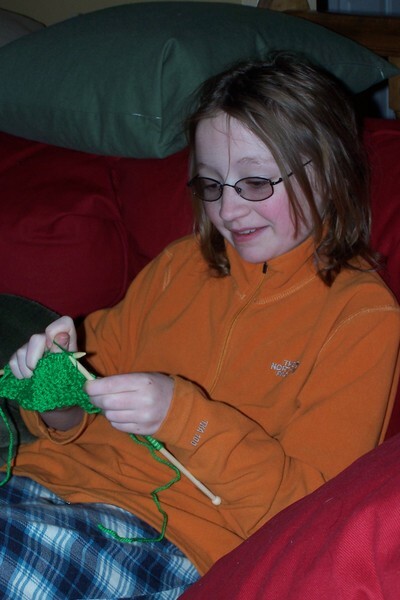 One of my best friends there loved to knit and watch movies! So once or twice a week, as our schedules permitted (our social calendars were pretty limited being 25 minutes from town!) we would get together and knit. It started with the two of us, then the group grew to almost every female that worked at the school! Not that we didn't invite the guys, renting chick flicks assured that we could be testosterone free for the evening. Well, seeing the awesome stuff my friend made, I didn't want to knit yet another scarf! So I went into town and purchased a relatively easy (so the woman told me in the knit shop) sweater pattern. Now not to make my life too simple for my first sweater, I couldn't find the yarn I wanted so I got two different yarns. I knitted them together to make a thicker sweater...Wyoming tends to be a bit chilly you know. So each night, when I wasn't otherwise engaged, I worked on my first sweater. I had my handy dandy knitting friend to decipher all the *p2,k3, slip double flip, p3, k274, repeat* knitting code in the pattern. And it worked! I made my first sweater! I still have it too...18 years later! Well, you can't expect me to give it away...cuz I'm sentimental that way. So that started it. I've been hooked ever since and only occasionally need to call mom to translate a knitting direction. The past few years have been busy so I haven't done much knitting. Life gets in the way of sitting and relaxing during the evenings. Plus, by the time I sit down in the evening...I'm too tired to tired to do it. 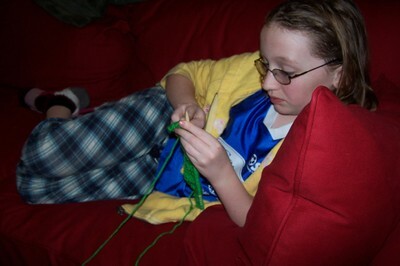 But my girls grew up watching me as well as their Grammy knitting. So here it is, Spring Break, and this week someone else decided to take up the needles. Now granted I've tried to teach her a couple times, her Grammy has tried to get her started a couple times, but the recessive gene finally kicked in this week. She just sat down after her shower the other night and decided it was time. That knitting urge can be strong. Heck she got me thinking about picking up the needles the other night! You go girl! Look at how much you've done! You'll be making a sweater before you know it! 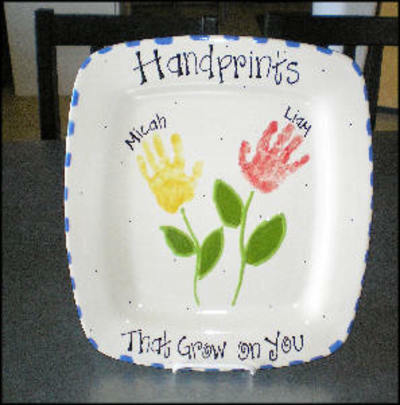 But we discovered a really cool thing to do here in the Inland Northwest: Painting Pottery. I remember doing this as a little girl. They were figurines and piggy banks and things like that. We didn't have a place to do it where we moved from, but quickly we discovered that there are many places to do it here. And the assortment of things to choose from is so much better! Plus they fire the piece now and make it look really professional! 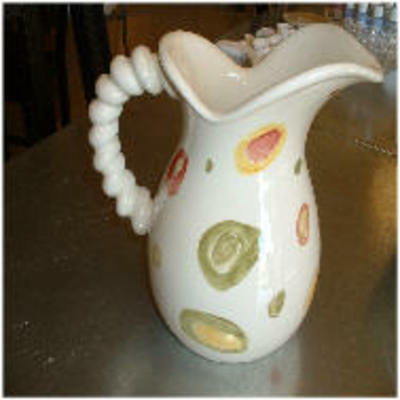 One of our fav orites--it's the closest one to our home--is Polka Dot Pottery. There are no studio fees and there are many paints for you to choose from. They have two locations now, one on the North side of Spokane and a second one now in Spokane Valley. The location in Spokane Valley is offering fun kids classes. Give them a call to find out more....and we may just see you there! 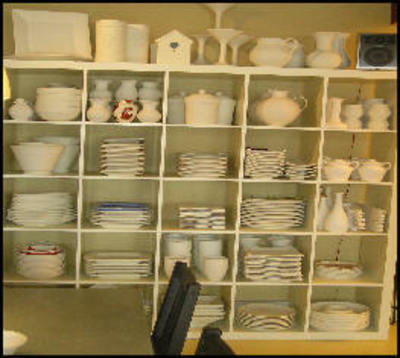 Although our we have our favorite studio, there are a number of others in the area, both in Idaho and Washington. If you know of one that I haven't metioned, let me know. Here are some other studios I've found. I haven't been to these places, but if anyone knows anything about these places, let me know.